We make meaningful, holistic change, under the framework of Applied Behaviour Analysis (ABA), and a uniquely child-centered, play-based approach to education. This blog is a resource for MM parents, community members and staff; happy reading! May this blog help you find evidence-based methods, gold-standard service, and an exceptional understanding of your Magnificent Mind. 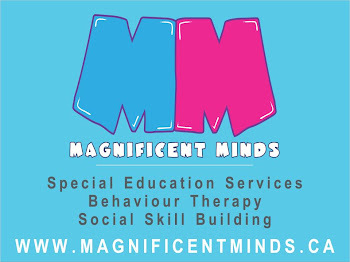 www.MagnificentMinds.ca for more information on the Toronto based company. We're blogging at a new address, linked to our homepage. If you haven't check it out, you're missing out on up and coming posts! Stop by and give us a shout out!